Courtesy of Ashby Realty Group, LLC. Custom Estate with some of the best views in the Valley! This Ahwatukee gem backs to South Mountain, so serene, you won’t want to leave your home! Boasting a very open floor plan of over 6,000sf, seven bedrooms and 5.5 bathrooms on nearly 1/2 acre! The living room ceilings rise to over 20 feet! Travertine tile throughout the main floor. Downstairs, the den has a closet and full bathroom. There is also another downstairs bathroom and another full bath and powder room. Gourmet kitchen features granite counters,gas top stove and stainless appliances. Plus a gas fireplace in the eat-in kitchen. Also, there is a wet bar off of the living room for that evening glass of wine. Two laundry rooms, one upstairs and the other downstairs. Two master bedrooms upstairs, perfect for guests or teens. Directions: West on Equestrian Trial, North on Kachina to property located on right side of Kachina backing up to South Mountain. Approximate size: 20817.00 sq. ft. Please, send me more information on this property: MLS# 5826973 – $1,450,000 – 3430 E Kachina Drive, Phoenix, AZ 85044. 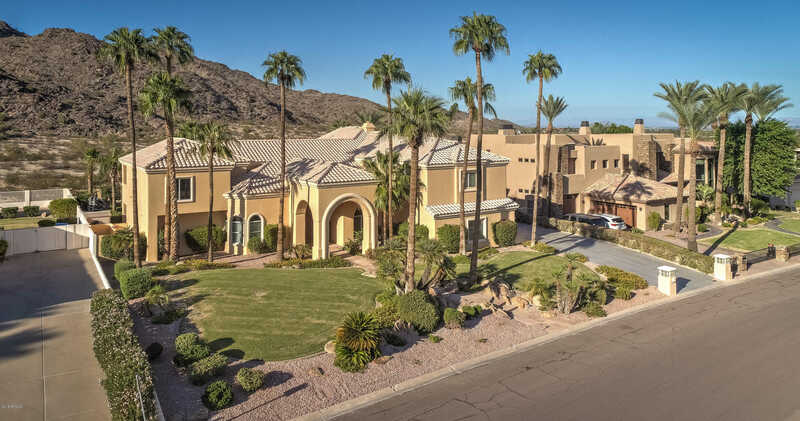 I would like to schedule a private showing for this property: MLS# 5826973 – $1,450,000 – 3430 E Kachina Drive, Phoenix, AZ 85044.